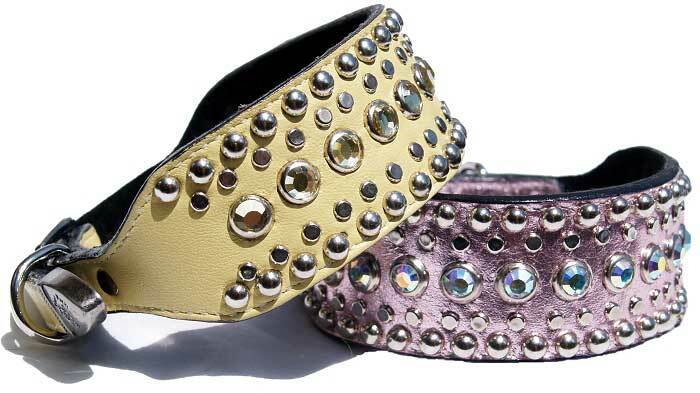 One and a one quarter inch wide collars tapered to 1/2" width at buckle and tip ends with a single row of Austrian crystal and two rows of studs and nailheads. Backed with soft black suede. Lovingly handmade in America by skilled artisans. 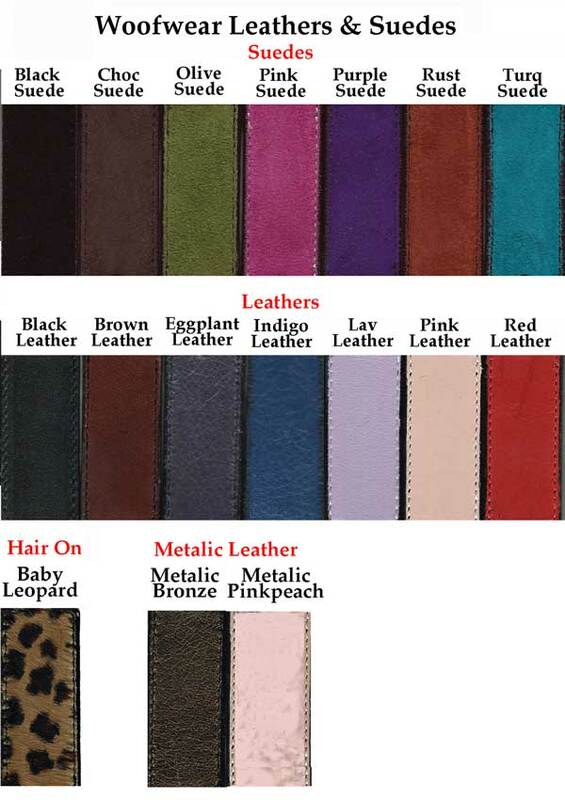 This is one of our premier tiny award winning leather dog collars at a very reasonable price. 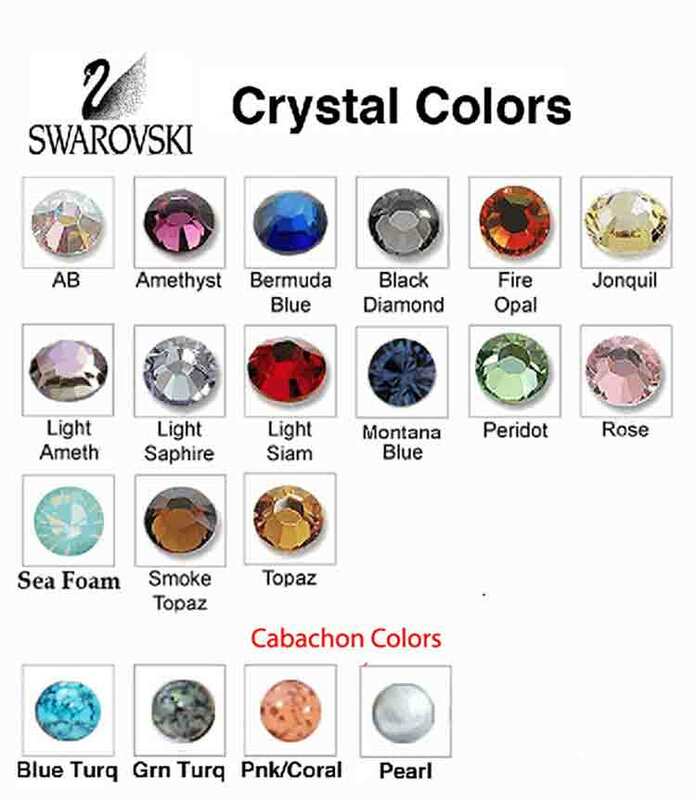 I have purchased several from this company and never disapointed. I purchased my first Woof Wear Collar in February of 2010 for my newly adopted rescue poodle named Rusty (he's a red poodle). We decided on the Rusty/more red suede with the fire opal Swarovski crystals in the Diva style. He has worn it everyday since and we still receive compliments everyday and people asking where we got it. My mother has purchased 4 since that time, my sister has purchased 2. On July 3 I adopted my second rescue poodle (this one is black). I initially ordered a turquoise mini diva, but when I got it, it the color was great, but not when I put it on him. I decided to order a purple one and am awaiting its delivery right now. When my mother found out I had purchased a new Woof Wear collar and that I had actually been able to speak with someone in their store, Dennis, (who is absolutely great! 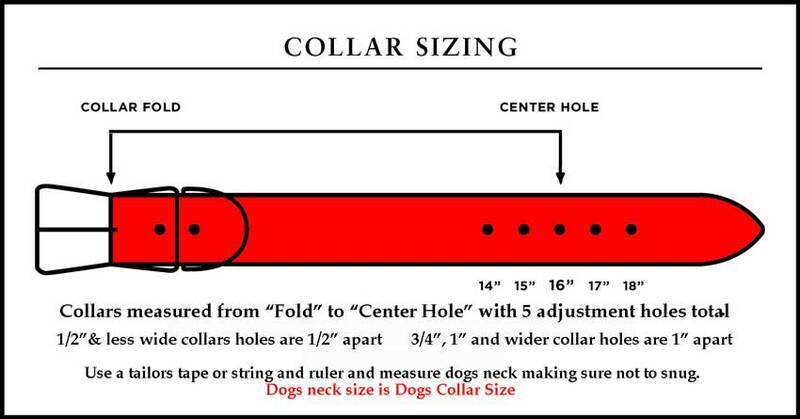 Awesome customer service and willing to do anything for you and will give you great recommendations) she decided she wanted a custom made Woof Wear collar for Allie (the standard black poodle that they adopted a couple of months ago) so she asked me to contact Dennis and come up with something. During this process Dennis was very helpful, he explained why we probably wouldn't want to do certain thing and what he thought would look the best. He was right. Her collar came in over the weekend and it AWESOME!!!!! It's a bright pink suede with a row of nail head studs going down each side of the collar with 4 rows of AB Swarovsky crystals that is going to look great on Ally. Just wish I could submit a photo here! All items for sale on this site and their design are copy written by Woofwear/World Critter inc. All Rights Reserved. Any unauthorized duplication is a violation of federal law and subject to the harshest penalties there under. Copyright 1994-2017 World Critter Inc.